Ecstasy, or MDMA Methylenedioxymethamphetamine Is a synthetic “designer” drug, derived from methamphetamine, which is usually concocted with ingredients such as ephedrine (a decongestant) and sodium hydroxide (lye). Tablets are colorful and made to look like candy. May be stamped with popular logos or brand names. Kandi Kids: wear outrageous, flamboyant, colorful clothing and jewelry. ​Ecstasy comes in pill form and is most commonly administered orally, but some users snort it, inject it or use it as a rectal suppository. Ecstasy stimulates the release of serotonin, a neurochemical responsible for regulating a number of mental processes including memory, mood, thought and pleasure. Ecstasy targets neurons in the brain that use the chemical serotonin to communicate. Long-term or heavy ecstasy use can damage these neurons and cause depression, anxiety, confusion and interfere with sleep and memory. The Brain on the right shows healthy serotonin levels. Bright orange and yellow areas indicate serotonin. The image on the right was taken three weeks after the last dose of ecstasy. Serotonin levels are nearly depleted. 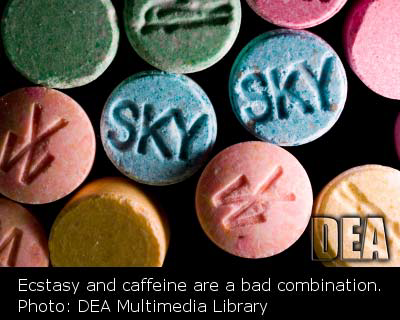 ​Ecstasy heightens tactile sensitivity which promotes physical/sexual activity among users. Increased risk of sexually transmitted diseases. ​Increased risk of sexual assault. ​The increase in serotonin provides energy, allowing individuals to dance or engage in activities for long periods of time. 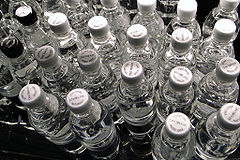 Many deaths associated with this drug are a result of dehydration and heatstroke after long sessions of dancing. In addition, many ecstasy pills are made with other drugs, and can cause overdose and other adverse affects. Combining alcohol with MDMA is also dangerous and increases the risk of adverse reactions and overdose. The rave culture promotes acceptance. For teens that are struggling to “fit in” it may seem like an attractive way to fill this need. The acronym “PLUR” which stands for Peace, Love, Unity and Respect is the motto of the rave culture. Pacifiers, Suckers/Hard Candy are used to relieve grinding of teeth; a side effect of Ecstasy. ​the effects of the drugs. 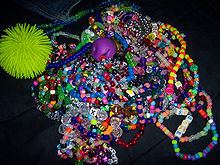 Bright Colored Jewelry provides visual stimulation and is a social identifier for the rave culture. “PLUR” is the motto for the Rave Culture. It stands for Peace, Love, Unity and Respect.